Kasseler Rippchen are pork chops (cuts of pork loin) that have been smoked and ripened in a salt brine. The process of smoking meat and letting it ripen in a salt brine is known as "Kasseler." In Germany, this process is used on other cuts of pork, not just the pork loin. Any cut that has gone through the "Kasseler" process is given the name Kasseler. For example, Kasselernacken is pork shoulder. Kasselerbauch is pork side. 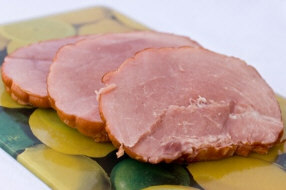 Kasseler Rippchen is very similar to ham, except that it is a bit more smokey, slightly drier, and less salty. Kassler Rippchen can be pan fried, grilled, added to soups and stews, baked (with or without a crust), or steamed (such as in Sauerkraut). It goes well with cabbage dishes, such as Sauerkraut, red cabbage, and kale (Grünkohl). Be careful with seasoning - the meat is already salty from the salt brine, so additional salt is rarely needed. The process of smoking and ripening in a salt brine, makes the meat ready-to-eat as is. So, keep in mind, that the cooking time of Kasseler Rippchen is short - it really only needs to be heated through. Kasseler Rippchen goes well with a cold German beer. The "Kasseler" procedure was invented in 1880 by a butcher in Berlin (last name Cassel). He smoked a large pork loin then allowed it to ripen in a salt brine. By doing this, moisture was drawn out of the meat, thereby preventing bacteria from spreading. This process preserved the meat, but also gave the meat a distinctive taste. It soon became a favorite in and around Berlin. Its popularity spread throughout Germany, where it remains a favorite dish today.